Posted: Wed Oct 20, 2010 11:12 Post subject: Google Ads keep this community free to join! um....yeh, id say it does, it can hold a straight line now!!! altho the wider wheels did look awsome!!!!!!! what do you mean hold a straight line? as in wander around the road? if that's the case them I'm relived! I thought i needed to get some new bushes! lol, wideboys are all over the place, 70mph is an adventure!!!!!!! whats the reason for it? any way of stopping it? i see ya selling ya wideboy stuff on the bay! 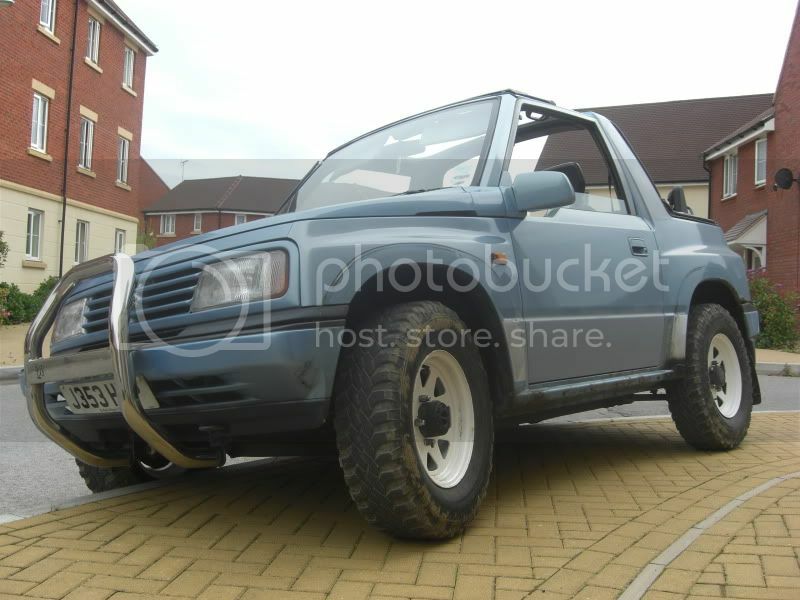 Yeah, change the wheels for standard Vitara wheels... but it will look odd with the wide arches. yeh, got loads of people wanting the wheels so have sold them seperate, will relist the arches and the side steps,the a-bars still on the car so might hold on to that till i get a bull bar..
looks bloody odd with wide arches and standard wheels.... my spare was a stock vit wheel with a skinny little bald tyre on it...am so glad i never got a flat and had to use it!!!!! has anyone thought about this. if you keep the steel wheels and add bolt on spacers to the hubs then you get to keep the skinny wheels and fill the arches. you also get a wider track that should make it more stable on sideways hills as it would alter the center of gravity. i'm not sure if it would alter the road manners but i have seen it done on normal road cars and it seemed to work. does anyone out there have all the gear they could test the theory and report back. i would but my car is dead at the moment. just a thought but take it with a pinch of salt as i am manwell i know nothing. any ideas?? ?